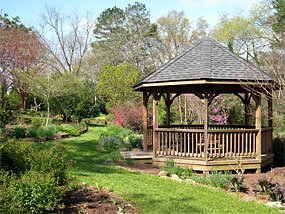 The Hatcher Gardens features 10 acres of gardens, ponds, and trees in the middle of urban Spartanburg, South Carolina. While many cities can boast of beautiful city parks founded from private estates, the story of the Hatcher Gardens is truly unique since it was started on land reclaimed from abandoned cotton fields. Cotton is still a major crop in the southern part of the state, but cotton fields have gradually dissapeared in the Upstate SC area. As erosion stripped the fields of topsoil, and the textile industry moved abroad, many mills were closed and fields became empty stretches of parched red clay, strewn with trash and debris. The challenge of growing in the red clay didn’t seem to phase the Hatchers, however. The Hatcher Gardens began in 1969 as Harold and Josephine Hatcher retired to Spartanburg, SC, and begin working an acre of land claimed from these abandoned cotton fields. They started small and bought up more land over time. They worked the land themselves, and then they eventually gained the help of community organizations and local gardening clubs. Mr. Hatcher continued to manage the garden into his 90’s. Today community volunteers continue the Hatchers' work. Spartanburg is lucky to have such a treasure within their city limits. Visiting the gardens is like stepping into a oil painting; it seems unreal to turn from a busy suburban street and suddenly find yourself surrounded by a canopy of trees. To find out more about the garden, visit the Hatcher Garden Website. Just happened upon your site, and most certainly a wonderful blog you have. Glad to run across another SC blog that has a nice touch to it! Thanks!! I love gardens and will keep this in mind. Great info. I Like this garden, and the Hatcher garden pound and trees.The story of Hatcher gardens is truly unique. I like it cotton is still a major crop really in southern part of the state.The textile industry moved abroad,many mills were closed and fields became empty.The Hatchers works and spartan burg is lucky to have a treasure. This land was for centuries a cherished hunting ground of the Catawba and Cherokee tribes, which occupied land Spartanburg, South Carolina - United States of America east and west of this area, respectively. This distant heritage can be glimpsed in some of the remaining natural features, often neglected and in need of help, that dot the landscape. Oh what a garden. Hatcher gardens is very beautiful. oh what a great hatcher's manage the gardn in his 90's. This is certainly the most interesting and informative blog i have ever cm across !! thank you for sharing this amazing information! !